When the PS3 first launched back in 2006 it made headlines for being the first Sony console since the original PlayStation to ship without a rumble-enabled controller. Although it’s never been officially confirmed, the reason for rumble’s omission was widely speculated to have come about as a result of Sony’s ongoing legal dispute with Immersion, a rumble technology company that claimed the PlayStation manufacturer was infringing on its patents. Now Immersion is back, and it’s partnering with Nintendo to deliver the HD Rumble functionality in the upcoming Nintendo Switch. We sat down with Immersion’s Business Development Director of Gaming, Matt Tullis, to understand more about the technology. What’s important to understand off the bat is that Immersion isn’t creating the rumble hardware directly for Nintendo. Instead its focus is on software which acts to allow the Nintendo Switch’s games to make the most effective use possible of the hardware. It provides similar software for app developers to allow them to make the best use of the vibration motors in phones. "We've invested heavily in our software. We're really focused on enabling great experiences," says Tullis. This is a different deal from the arrangement that’s currently held with Microsoft and Sony, Tullis explains, which is a licensing deal for a number of Immersion’s patents (the company holds over 2000 in total) rather than a partnership. These arrangements are what’s allowed both companies to continue to provide rumble in their controllers after the Immersion lawsuit. So how has Nintendo gone about enabling HD Rumble in the Switch? Unfortunately Tullis wasn’t able to give any specifics on Nintendo’s hardware, but what we do know is that the use of force-feedback in phones (an area which Immersion has extensive experience in) has lead to the development of much faster and more accurate actuators known as ‘linear resonant actuators’ (or LRA for short). In the past, console gamepads have instead used spinning ‘eccentric rotating mass’ (ERM) motors, which you’re able to see spinning if you’ve ever used a see-through gamepad. An uneven weight spins around, and its centrifugal force creates the sensation of rumble. In contrast, LRAs use a mechanism that’s very similar to a loudspeaker. A voice coil creates a magnetic field which moves a magnetic mass, generating vibration that’s much faster and more precise than an ERM. Check out the video below for a visual outline of the differences between ERMs and LRAs. So far first-hand reports of what developers have been able to achieve with the new combination of Immersion-developed software and hardware technology have been impressive. In particular, one of the minigames included in launch title 1-2 Switch tasks players with guessing how many virtual balls are inside one of the Joy-Cons. It provided a surprisingly accurate rumble sensation that allows players to accurately guess the number of virtual items. "They [game developers] are really going to bring some really innovative new things to market as we're seeing more and more use of haptics," says Tullis. 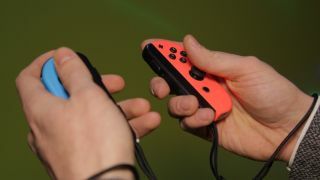 But as with many technologies introduced by Nintendo, whether or not the technology takes off will depend on how willing developers are to make use of it in their games. The Wii’s motion-controlling capabilities, for example, were used extensively by developers on the console, but the 3D functionality in the more recent Nintendo 3DS has ended up being sidelined by many. The fact that rumble has been core to the console gaming experience for around two decades now means that it’s a feature developers won’t be able to ignore entirely, but it will nevertheless be interesting to see whether many end up pushing the boundaries of what the console’s HD rumble is capable of. Check out everything we know about the Nintendo Switch, and also keep up to date with all the best Nintendo Switch deals.